Do you have a Samsung Galaxy S9 or S9 Plus? I don’t know when it is released but I keep seeing its ads everywhere but I cannot prevent myself from falling in love with it and finally have a 256GB version because I know it would be my great entertainment tool of watching Bluray DVD movies after work. So, in this post I’d like to share my experience of ripping my Bluray DVDs collections to Galaxy S9 compatible format, which also works for S9 Plus. If you don’t know how to transfer ripped videos to S9/S9 Plus, this guide will also help. 1 Most Compatible Video for Galaxy S9/S9 +? 3 How to Rip Bluray DVD to Galaxy S9/S9 Plus? 4 How to Transfer Ripped Video to Galaxy S9/S9 Plus? Most Compatible Video for Galaxy S9/S9 +? According to Samsung, both Galaxy S9 and S9 Plus are able to play videos in the following formats: MP4, M4V, 3GP, 3G2, WMV, ASF, AVI, FLV, MKV, WEBM. Among those videos, MP4 and MKV are recommended by me. Please DON’T go to 3GP, 3G2, FLV as I think they are a little out-dated and if you rip Bluray to 3GP/FLV for Galaxy S9/S9 Plus, you may probably lose a lot quality when ripping a DVD, not to speak of Bluray, while you have at least 64 GB space, which should not be a problem for storage. Also, Samsung does not specify the video code, but H.264 is recommended by me as it comes with top compression rate, meaning you are able to compress your Bluray DVD to a smaller size with original quality. And, it is the most compatible one so you don’t have to worry about the video sync problem, black screen problem during playback. Ripping Bluray to H.265 for Galaxy S9/S9 Plus is worth a try if you are interested in H.265 in MP4 or MKV. We see there are a lot of Bluray or DVD rippers that is able to rip Bluray DVD to MP4 or MKV, but which one is right for Galaxy S9 and S9 Plus? 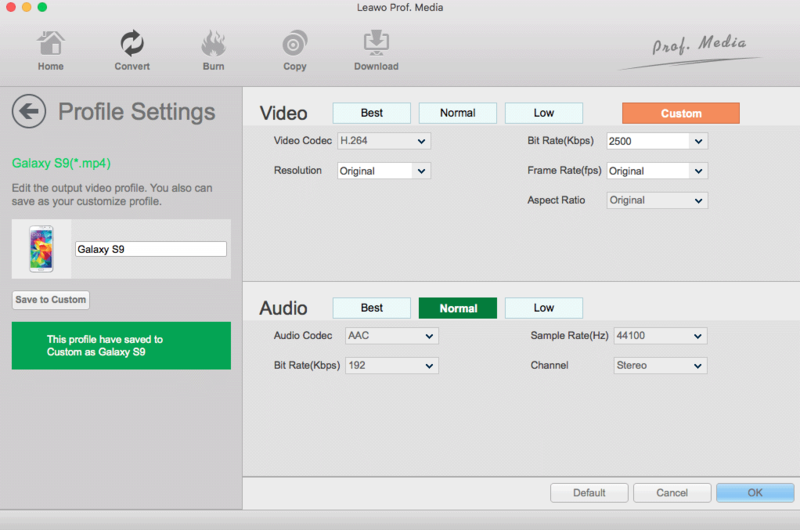 Leawo always upgrades itself to fully support different copy protections from Bluray and DVD. You are supposed to rip the latest protected Blu-rays like Wonder Woman as well as Disney DVD– Cars 3. Leawo is 100% compatible with the latest OS from both Apple and Microsoft. 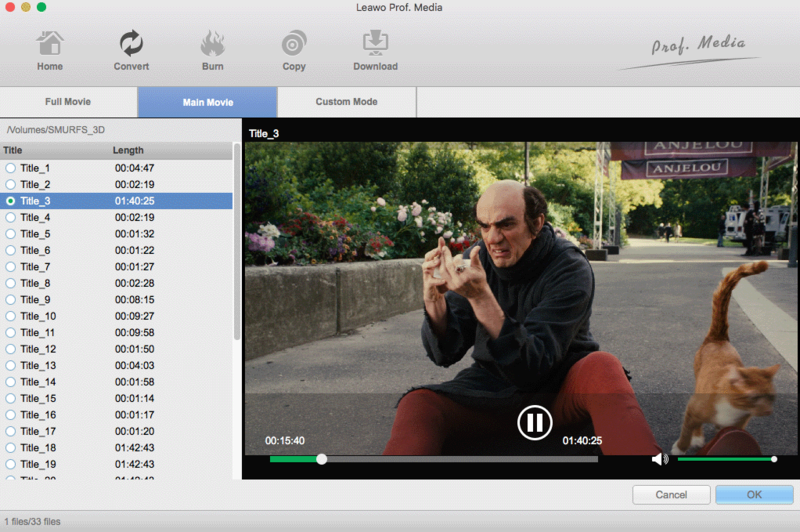 And I have good news that Leawo Bluray Ripper is fully compatible with macOS 10.13 High Sierra and will upgrade itself to 64 bit for macOS 10.14 Mojave. You are able to rip both Bluray and DVD to MP4 or MKV in H264 or H265. And it does good in preserving the original Bluray and DVD video quality. Leawo Bluray Ripper works for both Bluray and DVD! If you just need to rip DVDs, go for Leawo DVD Ripper. I’d like to recommend you guys download a free trial to see if it is 100% working for you. How to Rip Bluray DVD to Galaxy S9/S9 Plus? Below is a detailed guide on how to rip Bluray DVDs to Galaxy S9 and S9 Plus with Leawo Bluray DVD Ripper. You can follow the above buttons to download, install to have a trial. Please always note Leawo Bluray Ripper is a module of Leawo Prof. Media and the guide will apply to DVD ripping as well. Screenshots are made on macOS but applies to Windows as well. Click Bluray Ripper or DVD Ripper or the Convert tab on top and the load your Bluray DVD via Add Bluray/DVD button. The Galaxy S9/S9 Plus ripper takes only seconds to analyze the Bluray or DVD and display you the below window to choose the main or full movie for ripping along with the preview. For movie Bluray DVDs, I always recommend Main Movie. MP4 Video is the default output for both Bluray and DVD ripping. You can edit or change by clicking it. Leawo has profiles for Samsung devices but the built-in is quite old! But don’t worry, we can custom or build our own, which may be why Leawo is lazy in updating its profiles for better user experience? Here we custom our own profile for Galaxy S9/S9 Plus on Galaxy S5. I recommend to set the codec to H264, resolution to original for both Bluray and DVD. However, please note your output should be under 4GB, or you won’t transfer to your phone. We are almost done! Just click the Convert button and leave the job to Leawo! How to Transfer Ripped Video to Galaxy S9/S9 Plus? 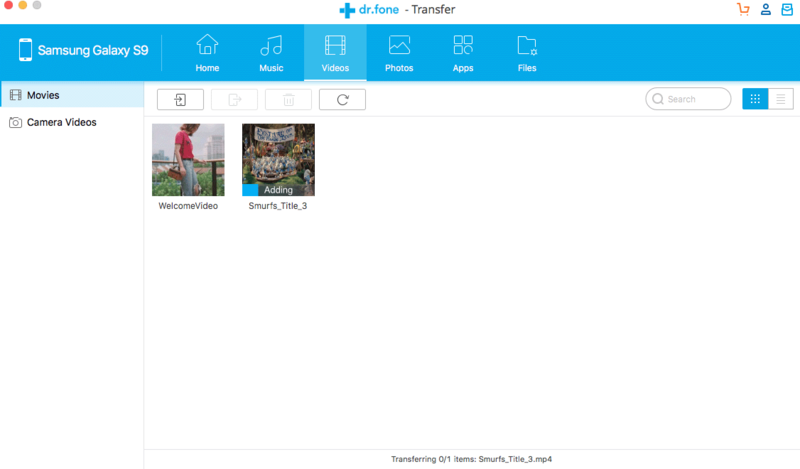 Transferring videos and photos on Android is easier than on iOS! And it is eayier to do so when you are on Windows than macOS. Generally, for the first time you connect your Galaxy S9/S9 Plus a PC, Windows automatically installs the driver for you and then you are able to locate your device on your File Manager and drag or copy files to it. However, when I connect the phone to my MacBook Pro running macOS High Sierra, nothing happens. 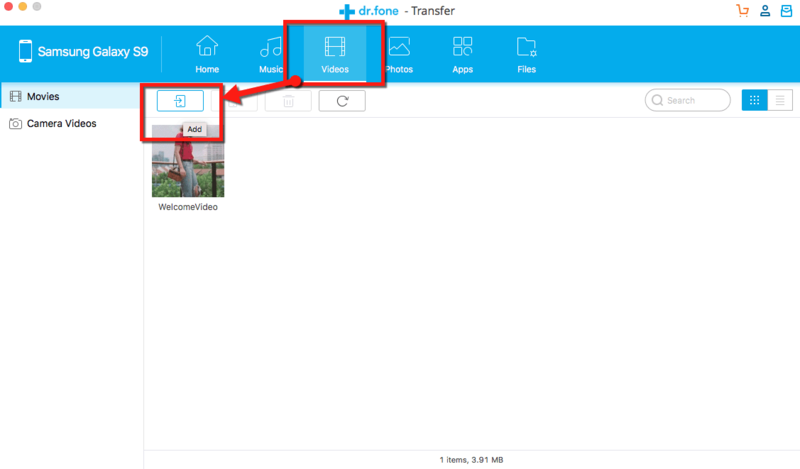 So, the below quick guide will help you guys who want to transfer the ripped Bluray DVD to your Galaxy S9 or S9 Plus on Windows or macOS and Wondershare Dr.Fone is right here to help. Wondershare Dr.Fone is an all-in-one mobile solution for both iOS and Android users to recover, transfer, backup/restore, switch, erase, repair data like videos, photos, contacts, SMS, music etc and unlock the device or root your Android. To transfer ripped Bluray DVD videos to Galaxy S9 (Plus), we just need the “Transfer” part. You can follow the above download buttons to have a free trial of Dr.Fone and click Transfer. It will automatically connects your Galaxy S9 and S9 Plus. Go to the video tab and Add video file via the below button. Locate the video you want to transfer in the pop-up window and you will see its transferring videos to Galaxy S9 automatically! ← How to Play DVD ISO file on macOS Sierra, High Sierra, Mojave Free?